Most SDR devices capable of transmitting available on the market have limited RF output power in order to meet regulations. In their factory form they are suitable as a laboratory instrument or an ISM device. The Ettus USRP is the first device to have full open-source support with Gnuradio, and its specs still make it the flagship of SDR hardware. It is only capable of putting out ~10 dBm according to documentation, which is a typical output power for an ISM device. Another popular hardware is the HackRF which has a somewhat similar output power. 10 dBm is a respectable power and it will enable you to communicate over ranges of 500 m to several km, depending on your environment and the mode of transmission you are using. However, for long range communication, more output power is required. Radio signal propagation characteristics determine the range you can communicate over. In some environments, like urban or mountainous terrain, VHF-UHF signals require significant power to overcome obstacles. You can calculate the link budget for your case using a radio prediction software like QRadioPredict or Splat. Amplifiers are usually categorized by one of their main characteristics: P1dB. In simple terms, this is the output power at which the amplifier deviates from a linear mode and compresses the signal by 1 dB. For example, a broadband linear power amplifier with P1dB of 27 dBm which can be found on the market cheap ($30) is usually quoted as a 0.5 W amplifier. However, you should be aware that depending on the quality, this amplifier will begin to distort the signal well below this quoted output power, and may be capable of only 23 dBm (0.25 W) before it loses its linear characteristics. As seen above, this has a large effect on digital signals. Most SDR devices have control over the gain of their final RF output stage. You may need to back off the power level into the RF power amplifier until you no longer see distorsion of the signal on the scope. 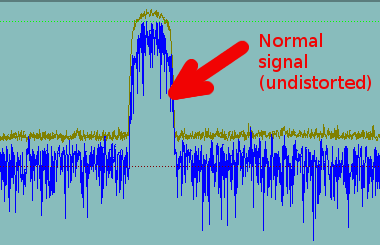 Thankfully, digital voice modes with low bitrate codecs like Codec2 require significantly less power than FM to demodulate the signal. This means that a 23 dBm (0.25 W) digital radio will get you the same distance as a 5 Watt analog FM radio. 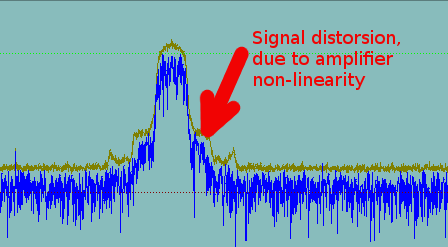 In addition, before amplifying the signal, you will need to clean it up from out-of-band emissions of the SDR device. By not pushing it and keeping the final RF stage of the SDR device within its linear mode, these spurious emissions will be kept to a minimum, and a band-pass filter or a low-pass filter for your band of choice will make sure the power amplifier does not amplify unwanted components. For VHF-UHF frequencies, such a filter is easy to construct by an amateur. Higher frequencies require components which may be out of a normal person's reach, thankfully the market has them for the most common ISM bands.